Start your Teide experience with a pickup from your Costa Adeje or Los Cristianos hotel. Includes cable car ticket. Start your Teide experience with a pickup from your Puerto de la Cruz hotel. Includes Cable car ticket. Start your Teide experience with a pickup from your Puerto de la Cruz hotel. Includes Observatory ticket. 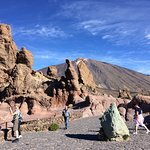 Stand in awe beneath the looming Mt Teide volcano and explore the lava-sculpted landscapes of the UNESCO-listed Mt Teide National Park on this 6-hour tour. Choose from two different itineraries depending on your pick-up point: those arriving from south Tenerife will stop off at the unique rock formations of Cañadas del Teide and Los Roques de García; while the northern route passes through the serene La Orotava Valley. 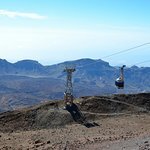 For the ultimate panoramic view, opt for a thrilling cable car ride up Mt Teide, the highest mountain in Spain. 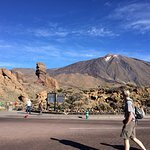 At your north or south Tenerife hotel, you’ll board an air-conditioned coach destined for the UNESCO-listed Mt Teide National Park. Receive an introduction to the area from your guide and, depending on your pickup location, follow one of two itineraries detailed below. Guests staying in hotels in Los Cristianos or Costa Adeje, stop first at Vilaflor — a picturesque mountain village — to refresh with drinks and snacks at your own expense. Continue inside the magnificent national park to Los Roques de García, home to the world-renowned red rock, Roque Cinchado, to capture photographs of the magnificent lunar landscapes. At your own expense, you’ll revitalize with lunch at Parador de Cañadas del Teide — a hotel, located in the Cañadas del Teide crater, that boasts impressive views of Mt Teide and the Pico Vieja crater. 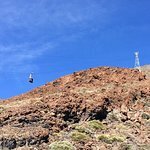 Sated, opt to explore the rugged sculptures of Los Cristianos or Costa Adeje at leisure, or take a cable car ride to Mt Teide’s summit at your own expense. At a time prearranged with your guide, return to your coach and relax during the journey back to your south Tenerife hotel. If your hotel is located on Tenerife’s north side, travel through the La Orotava Valley (Valle de la Orotava), a lush region replete with dramatic gullies and cliffs. 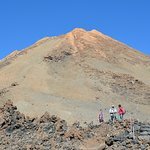 Gaze at the dramatic mound of Mt Teide as you explore the region’s luscious landscapes with your guide. 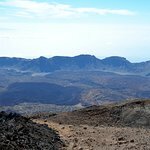 After marveling at enormous Canary Island pines, you’ll venture to the heart of Mount Teide National Park for a comprehensive tour. 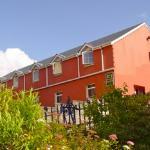 Alternatively opt to ride a cable car to the volcano’s summit at your own expense. After thorough exploration of the park, relax during the air-conditioned drive back to your north Tenerife hotel. You must book in advance over the internet to get the ticket the day and time you want, otherwise there is no chance to get it. You can get by renting car. Hello, thank you very much for your comment, we are glad that you enjoyed the activity. Best Regards. 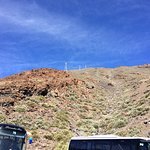 Get quick answers from Teide National Park Tour Including Transfers and Cable Car or Observatory Tickets staff and past visitors. Have a hire car. What and when best time to go?